“Economic losses were estimated at $274 million. The storm dumped up to 83 inches of rain on some parts of the island, according to the U.S. National Oceanic and Atmospheric Administration. “I’m afraid of turning on the television to watch the news.” — Taiwan’s everyday leisure activity has become Taiwan’s everyday nightmare. It’s been five days since typhoon Morakot ferociously swept past southern Taiwan. Looking at the topographic view, the murky rivers left in Morakot’s wake look like scars on the face of the island once called ‘Formosa’ by Portuguese sailers, Beautiful island. Taiwan’s biggest rivers were made even bigger when mudslides widened them. A recorded river 50m wide was a gaping 800m wide after the typhoon had left. Torrential rainfall tore open river mouths and caused landslides that covered entire villages in a matter of seconds. Taiwan’s muddy agricultural mountains only fueled the raging waters with more mud and more debris. On-going rescue missions seem to be encountering more and more difficulty because of the convectional rainfall these couple of days. It seems like they’re not going to be getting a break any time soon; the CWB tells us that this kind of heavy rainfall could persist for a week or more. One of the faculty members from our history department made a small example of the rainfall Taipei has been receiving over the past few days. Yesterday and today, Taipei recorded 30cm of rain water in just one hour, with the rain continuing for about three hours a day. Needless to say, some parts of Taipei were severely flooded. In some cases, the flood water reached waist height. A few of us even caught a cold as we trekked home through the pounding rain yesterday afternoon. We were reminded though, that this was nothing compared to the 270cm rainfall recorded over the three days that Morakot was hovering over Taiwan. Over those three days, southern Taiwan received more precipitation than Indonesia receives in an entire year. Small wonder the rushing water cleared roads, bridges, houses and villages with little strain. Taiwan’s landform doesn’t help to ease flooding either. 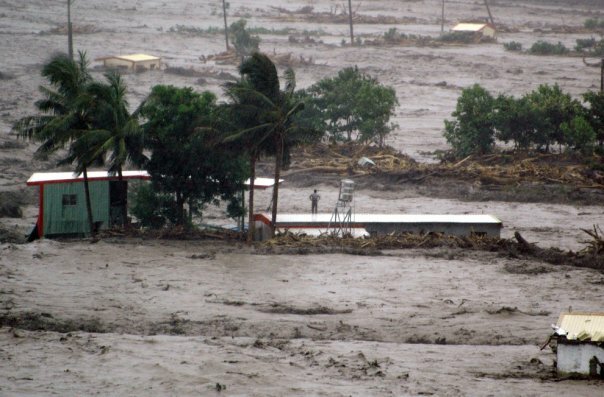 With mountain ranges as high as 3,800m, but a width of only a few hundred kilometers, the waters rushing down are strong enough to compare to those of a tsunami. Our history teacher also tells us, that if the typhoon had affected Taipei, which is an overpopulated basin, with that much rainfall, we would most certainly have drowned. Taipei doesn’t have the ability to evacuate, it’s too densely populated and is home to too many people whose lives depend on this tiny city. Most of them, I’m sure, would rather be washed away with their life’s work than watch their life’s work wash away before them. Our geography teacher got all red-eyed and was on the verge of crying when she spoke about the situation in the south. Maybe it’s the mother in her, or maybe it’s that she understand this is a situation nobody should have to go through. And being learned in geography, she understands the true gravity of what has occurred. Whatever it was, she was very sensitive when talking about typhoon Morakot’s destruction. The quote above is not from her, so I can tell that many people, not only her, are deeply concerned about the well-being of the people still trapped in the wreckage, as well as the well-being of this nation. I never watch T.V. in Taiwan, but these few nights I’ve been turning on the television to watch the six o’clock news. The scenes are horrific. For those of you witnessing everything unfold in other parts of the world, what you see is probably only an edited glimpse of the true devastation that we behold. I could just get all my updates from BBC or CNN, but I’ve found a fundamental difference between foreign reports and local reports: subtlety. Or the lack of, in Taiwan’s case. On foreign news, I see scenes of rescue helicopters and rushing waters. On local news, I see DIY camera footage, taken by people who were trapped beneath landslides for days; recording every hour, every minute, every second. I see people howling as the doors to an ambulance open to reveal their deceased relatives and friends. I see people shouting, screaming, hurling abuse at the government for a rescue operation poorly executed. I see reporters, unable to repress their fear and shock at the destruction the typhoon has left behind. In local news, I see the reality. The striking reality of what was, what is and what could have been. All the talk about better preparation and more competence in the government’s rescue operations, and I think to myself, you know, now is probably not the best time to be blaming one another. We’re in a national crisis, so hold hands, and pull each other out of it. Come on! But like most times, easier said than done. One can not sit emotionless when looking at what we face, but living in an area not affect by the typhoon, I’ve realised that it is very hard to conjure up the courage to say that I wouldn’t react in the exact same way. Fear and apprehension grip this nation as we head into a year-long battle to revive ourselves. The 108 recorded deaths rises exponentially by the hour. The missing and injured numbers are just a figure for the sake of charting. The true estimate is, in fact, in the thousands. Nothing could have prepared us for what happened last week. Not CNN, not the CWB, not the government. We all know that natural disasters are the most unpredictable forces on our planet, but maybe this was one car crash that couldn’t have been prevented by using non-slick tyres. Who knew that typhoon Morakot would be made stronger by another low-pressure storm system and emerging South Westerlies? And who could’ve known that El Niño would decided to join the party right at the very end. Barack Obama’s leadership skills are being tested as he thinks up a new healthcare plan for the United States. He calls it ObamaCare; Ma Ying-jeou’s leadership skills are being tested as he faces the worst case scenario of any downfall. We call it Typhoon Morakot. A true test of character awaits, as Taiwan, along with the help of outer resources, such as the Red Cross, battle the rising tide. Best of luck, Mr. President. My thoughts go out to those who are still left in the rubble of Morakot’s passing. The silver-lining is there; be it however bleak, it is there, for as long as you’re willing to reach it. ‘Godspeed, rescuers. Godspeed, survivors. Godspeed, Taiwan.’ JSF.